They like BLTs. They like macaroni and cheese. 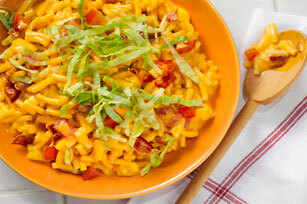 So it stands to reason that this easy twist on mac and cheese will be a hit at your house—no matter when you make it! Omit bacon, tomatoes and lettuce. Prepare Kraft Dinner as directed on package. Add 1/2 cup chopped green peppers and 2 Tbsp. pizza sauce or tomato sauce. Top with 1/4 cup quartered pepperoni slices and 1/2 cup Kraft Mozzarella Shredded Cheese. Omit bacon, tomatoes and lettuce. Prepare Kraft Dinner as directed on package. Stir in 1/4 cup sour cream and 2 Tbsp. chopped pickled jalapeño slices. Top with 2 sliced green onions and 1/4 cup crushed tortilla chips.